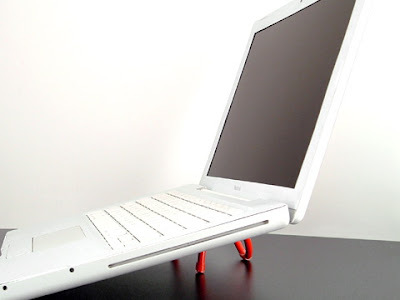 By clever product maker Laboratory 424, The Mini Riser is the kind of design that makes me sigh with relief. It does just what it's supposed to do, without much fuss, and only a few resources. bliss. If you're like me, the permanency of a desktop computer makes me anxious. My daydreams of spontaneous trips to the Galapagos would be squashed if i couldn't bring my Life (a.k.a. my MacBook) along... and when I'm in these fantastic, exotic locations (or cottages 3 hours north of Toronto) I would prefer not having to crouch over my work... here's where this nifty little guy comes in. The easily transportable Mini Riser keeps my back straight, elevating my other half (a.k.a. Macbook again) from grime ridden surfaces, while keeping its under-carriage cool and dry. According to the instructions, the Mini Riser will dramatically affect your coolness factor as it tends "to attract attention in coffee shops, classrooms, libraries, etc. Make sure you dress nice, comb your hair and carry along an extra riser to share". Charmed. Check out another Laboratory 424 win on S|G.